Dog paw health greatly influences a dog's mobility. While paws are much tougher than human feet, they are still vulnerable to injury and certain health conditions. You can prevent injuries and keep a dog's paws healthy with basic grooming and by providing a safe environment for your pet. Learning about common paw conditions and injuries can also help you recognize and seek the appropriate treatment for your dog. Dog paws serve an important function by balancing the dog's weight evenly. They also provide traction and shock absorption to aid all types of movement from running to jumping. Dogs have four paws. A paw is comprised of four foot pads that each have a toe with a nail (claw) and one metacarpal footpad. The four foot pads and the metacarpal foot pad touch the ground when the dog stands. Some breeds also have a dew claw or "fifth toe" located on the inner paw that does not touch ground. Many breeders remove dew claws from puppies as a preventative health measure since these claws tend to catch on things easily, and this could lead to injury. Cat feet- The term cat feet refers to a compact paw due to a short third digital bone. Since these paws require less energy to lift, dogs with cat feet can move fast for long periods of time before getting tired. Webbed feet- Some breeds that were traditionally bred for water work have paws that have a webbed appearance. Hare feet- Hare feet are long dog paws with two center toes that are longer than the two side toes. Since a dog's paws may be exposed to all manner of debris, sharp objects and weather conditions, injury and health problems can occur. Typical injuries include abrasions, broken nails and cracked foot pads. Sometimes a paw condition also indicates a health condition such as erythema multiforme. 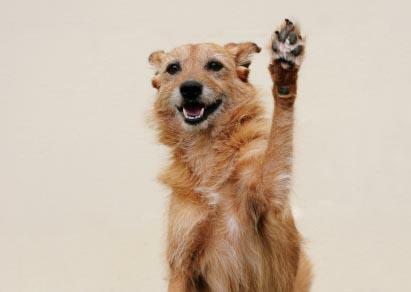 Preventative care is the best way to keep your dog's paws healthy. Dog paw injuries can occur anywhere that the dog's paw comes in contact with a sharp object or irritating element. Injuries can also be a result of a trauma such as a fall. Cuts- Sharp objects can create abrasions, lacerations and puncture wounds. Cracked footpads- Weather conditions and exposure to harsh chemicals such as ice melting products can cause dry, cracked foot pads. Scaling on footpads- Scaling on foot pads can indicate ichthyosis. Blisters and burns- Blisters and burns on the footpad may occur from contact with a hot surface such as walking on hot pavement. Interdigital cysts- When a foreign object penetrates the skin between the toes, a cyst or abscess may form in the affected skin. Itchiness and inflammation of the toes- Allergies and parasites such as chiggers can cause itching and inflammation between the toes. Broken nails- Nails may break or be ripped off if they catch on an object. Longer nails are more prone to this problem. Insects bites- Insect bites can cause an inflamed area on the affected footpad. Some injuries such as mild small abrasion or dry foot pads can be treated at home. Others require veterinary attention in order to heal properly. Bullous pemphigoid- This rare disorder causes blisters and ulcers on the skin. Blisters and ulcers may also appear on the foot pads. Erythema multiforme- The condition causes pustules or oval-shaped red skin eruptions on the foot pads and the mouth. Toxic Epidermal Necrolysis- The autoimmune disorder causes ulcers on the foot pads. It is important to seek veterinary treatment if you suspect your dog has any of these conditions. Early diagnosis and treatment provides the best possible outcome. When it comes to dog paw health, injuries can be minimized with prevention. Keep your home and yard pet-safe by removing any hazardous debris such as sharp objects or broken glass. Inspect your dog's paws every day to check for signs of trapped debris, cuts, irritations or broken nails. Always check your dog's paws after a walk. Trim your dog's nails short to prevent cracked and broken nails. Carefully trim small amounts at a time to prevent cutting the quick. If bleeding occurs, use styptic powder to stop the bleeding. Clear any foreign debris from in between the toes and foot pads. If debris becomes matted in the fur, carefully use a tweezer to remove it. If the mat cannot be untangled, trim it away with scissors. Take extra care of the dog's paws during the winter. The cold, dry air can irritate foot pads. After the dog spends time outdoors, remove any snow or ice caught in between his foot pads. Some dogs, especially small breeds that are less tolerant of the cold, can benefit from canine boots. The boots keep paws warm and protect them from harsh snow melting products. If your dog's foot pads become dry and cracked, apply a pet skin moisturizer. If your dog's fur tends to grow long between the foot pads, keep it trimmed short. The long fur tends to catch debris and irritate the foot pads. Use blunt-tip grooming scissors or clippers to safely trim the fur. Wash mild cuts with antibacterial cleanser and apply a loose bandage to the paw to prevent infection. Take your dog to the veterinarian if he is in distress or has a wound that is painful, swollen or does not heal. All deep punctures and lacerations require veterinary attention. Call the veterinarian if you are ever in doubt about how to treat an injury.